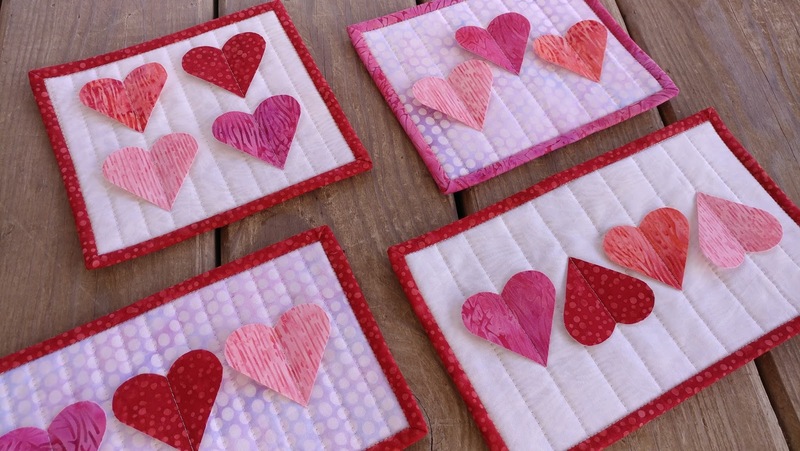 Slice of Pi Quilts: Happy Galentine's Day! 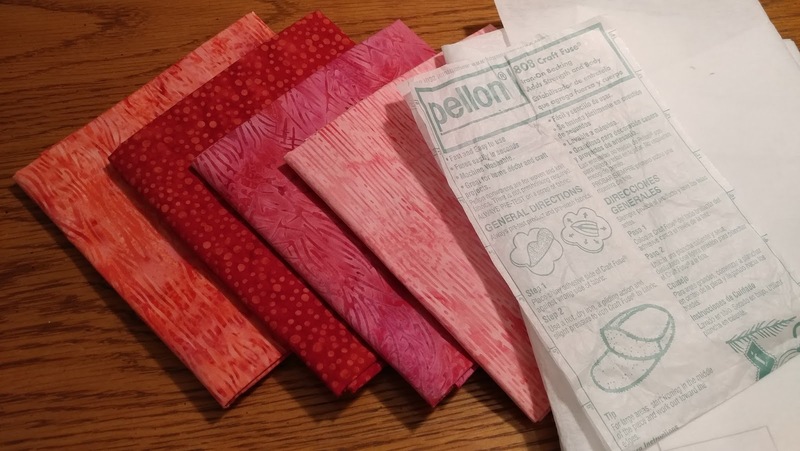 I started by pressing a 5" square of each of the four pink and red fabrics to a piece of Pellon 808 Craft Fuse. 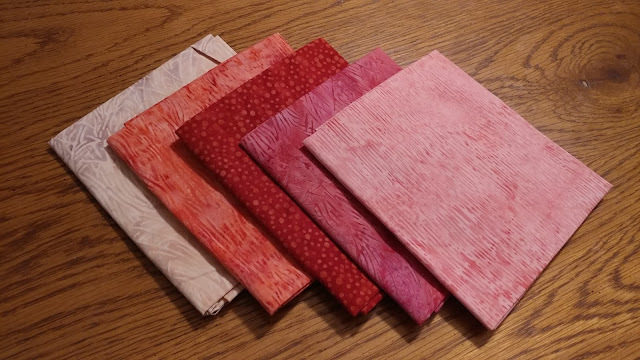 I made mini quilt sandwiches using some of the pink or red fabric for backing, a scrap of Warm & Natural batting, and a light colored Island Batik fabric. Each was about 6" x 9". I didn't even pin baste them! I laid the hearts on the quilt sandwich, and using my walking foot, I quilted one line through the center of each heart using 50wt Aurifil Light Sand #2000. 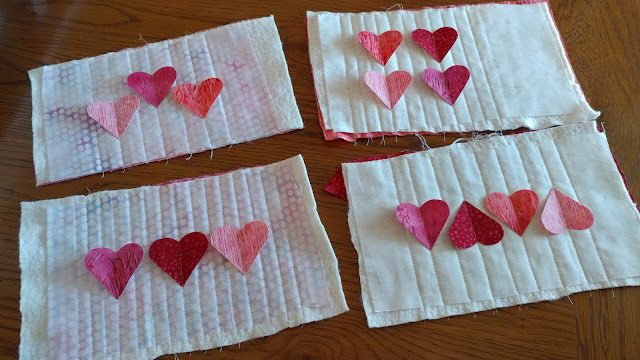 I added more quilting lines, lifting the edges of the hearts as needed. After quilting, I trimmed them up and machine bound them using 2 1/4" double fold binding. 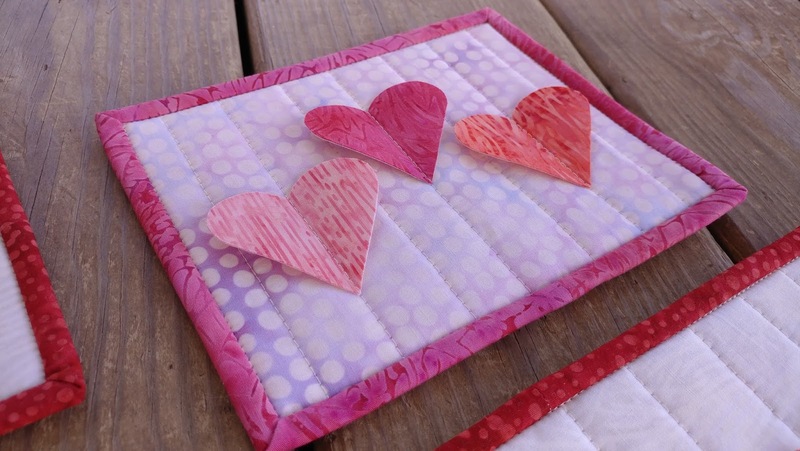 I love that the hearts are 3-D and stand out from the background fabric! 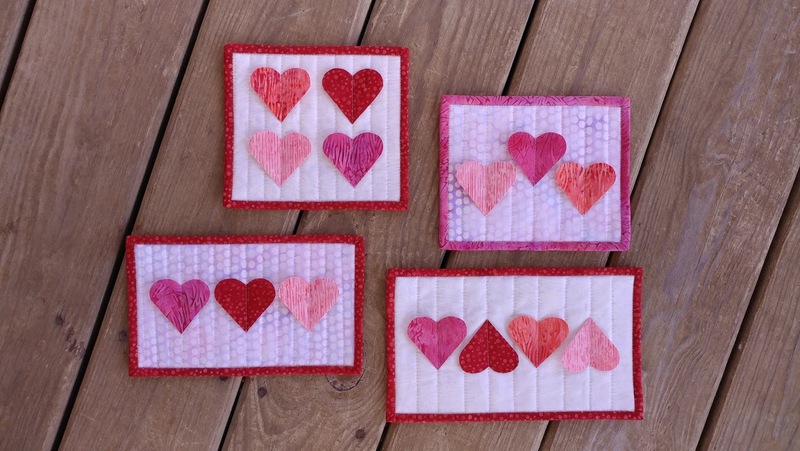 I've already put these in the mail for my Galentines! 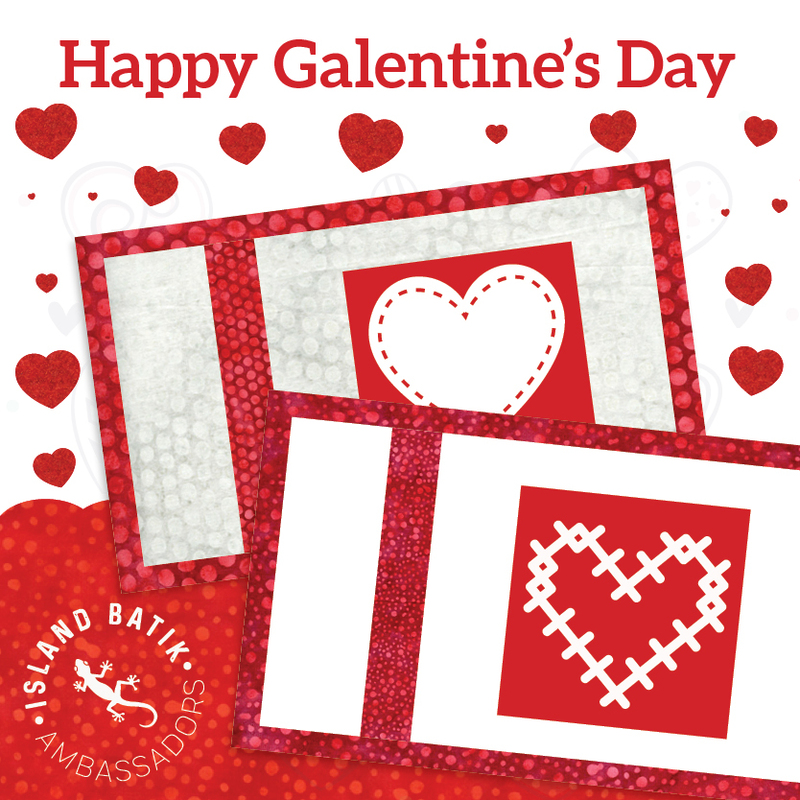 If you're interested in what the other Island Batik Ambassadors are making, you can check out their blogs. There are 45 ambassadors this year! 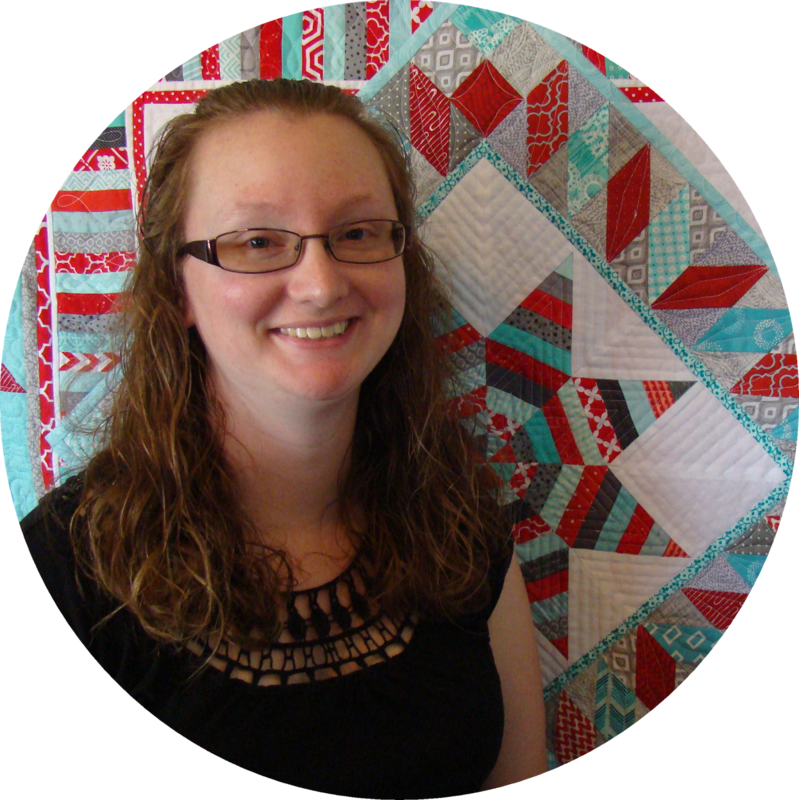 Be sure to follow Island Batik on Facebook and Instagram to see the projects we all make too! 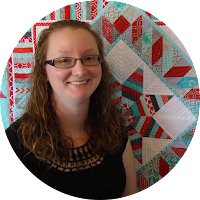 Laura at Slice of Pi Quilts <--- That's me! I have one more Island Batik project to make this month - so be sure to watch for that soon! I like that each one is unique. The 3D effect is lovely, too! So cute! What a great creative idea. I love dimensional things in quilting, so your hearts really make me smile!! Great mug rugs! Super cute, love the 3D hearts! Happy Galentine's Day!!! 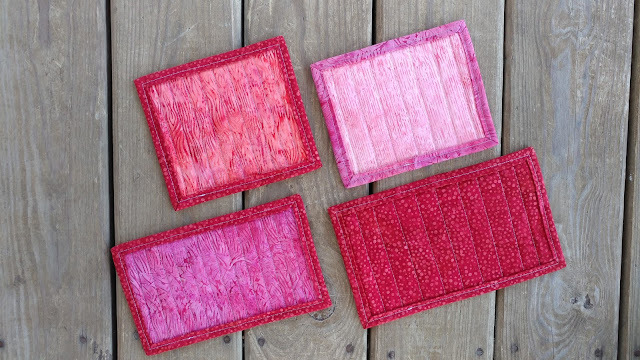 Super cute mug rugs and super fast, too! 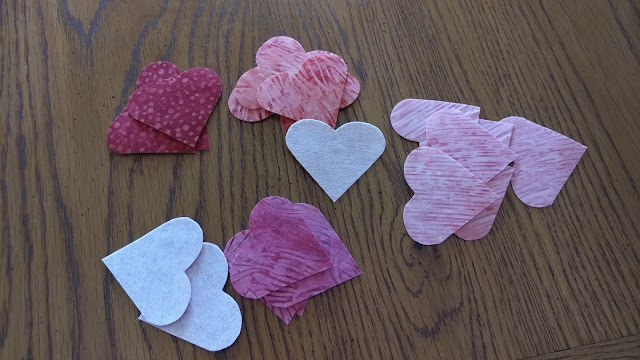 Great idea, I love the flappy hearts! Pretty project. Thanks for the list of ambassadors. The video is not working to show all the wonderful fabrics. These are fabulous! When hubby and I were first dating, I made him a huge heart, with layers of smaller hearts, all stapled in the center. Folding back the heart half revealed a note under each. Someday it would be fun to do that in fabric! I like that 3D effect. It makes them a little more fun. 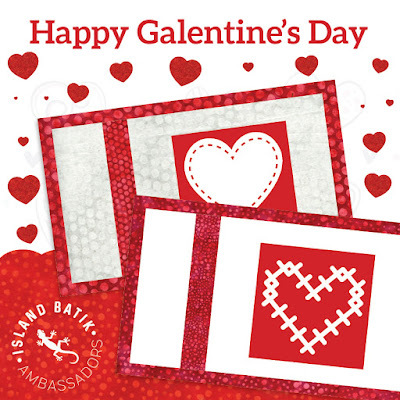 Laura, I'm loving all your Galentine's Day minis--and not just because I love Leslie Knope and Parks and Recreation :) Quick question--is there any link to making the hearts in the Island Ambassadors Galentine's Day visual you've got near the top? I'm smitten with that heart with the cross stitching along the edge. Thanks for all the great inspiration you share with us!